Book lovers – you must go and buy this little gem of a book immediately! I need only mention some of the chapter headings in this book and I just know that you will be nodding and smiling in recognition: ‘Visiting someone’s home and inspecting the bookshelves’, ‘Impromptu bookmarks’, ‘Hiding yet more purchases from partners’, ‘Spying on what others are reading’, ‘Feeling bereft having finished a book’, ‘Choosing and anticipating holiday reading’. You are already thinking this book is written about you aren’t you? Well that would be the chapter ‘Feeling a book is intimately for you’! As well as the joy of recognising yourself and your reading habits in the pages of this book, you will undoubtedly appreciate the passion of the author for his subject. 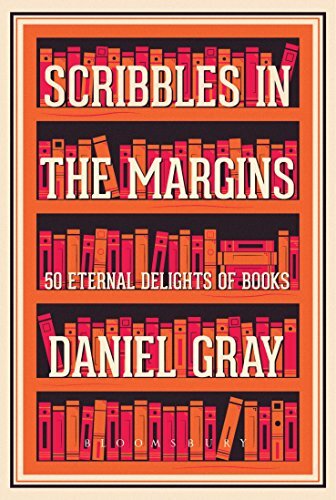 As you may have read earlier this week, I went to see Daniel Gray at the Edinburgh Book Festival and he spoke about how reading is a real escape from our busy lives. Other escapes can be more of a distraction such as losing an hour on social media, but reading remains a dedicated escape. He has a real eye for detail, which is why any book lover will recognise themselves in this book. I was reading the book on the bus on the way to the event and I couldn’t help but laugh when I came to this chapter! If I could add to the delights listed, I would definitely include reading my own much loved copies of my childhood books to my own girls when they were young. A more recent delight is that now they are in their late teens, I can pass on many of the books I have read and we can talk about them together. It is a true delight to share the love of reading with my daughters. This is a little gem of a book which I recommend to anyone who loves reading – and you do don’t you if you are reading this? I can’t wait to see what delights Daniel Gray will share with us next. You can of course buy Scribbles in the Margins at all good bookshops and I’m sure it can be ordered if not in stock. I almost hesitate to give you a link to the online retailer but, since so many people sadly no longer have a local bookshop, you can also order a copy here: Scribbles in the Margins You can buy a Kindle version but really, to appreciate the book fully, you should get the beautiful hardback copy. Warm, heartfelt and witty, here are fifty short essays of prose poetry dedicated to the simple joy to be found in reading and the rituals around it. These are not wallowing nostalgia; they are things that remain pleasurable and right, that warm our hearts and connect us to books, to reading and to other readers: smells of books, old or new; losing an afternoon organising bookshelves; libraries; watching a child learn to read; reading in bed; impromptu bookmarks; visiting someone’s home and inspecting the bookshelves; stains and other reminders of where and when you read a book. This sounds absolutely delightful and yes, written for me! I’m so off to buy this now!! !